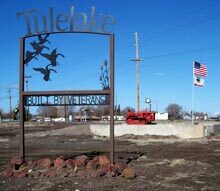 Tulelake - So Much to See - So Much to Do!! Steeped in nature and history, Tulelake offers a splendid hub for your next vacation. For the geologist in you, explore the Medicine Lake Highlands, the 24 mile diameter Medicine Lake Volcano, beautiful Medicine Lake at its crest, the fields of volcanic glass obsidian on Little Glass Mountain as well as the many caves and twisted volcanic landscapes of Lava Beds National Monument. While here, travel the Volcanic Legacy Scenic Byway - All American Road from Crater Lake National Park to Lassen Volcanic National Park. Your inner historian will revel in the pre-history of Petroglyph Point, the history of John C. Fremont and Kit Carson's explorations, the Applegate Trail, the Modoc War, and WW-II's Tule Lake Segregation Center National Historic Landmark. Start your historic adventure at Tulelake's outstanding museum located at the Tulelake - Butte Valley Fairgrounds. Naturalists will enjoy the Tule Lake National Wildlife Refuge and the millions of birds that migrate through each spring and fall and thousands that stay all year. The Klamath Basin Birding Trail and knowledge of the wildlife habitats found here will make your birding and wildlife adventures productive and enjoyable. To learn more, watch this short video about the Klamath Basin National Wildlife Refuges. Bring your camera! The opportunities for outdoor photography are boundless. To whet your appetite and supercharge your creativity, explore the thousands of photos as well as videos developed by Anders Tomlinson and presented on his Tulelake website. Photo blinds at the Tule Lake National Wildlife Refuge will make your wildlife photography even more exciting. We know you will enjoy your stay with us. See you Soon!